Chocolate mousse cake for two. 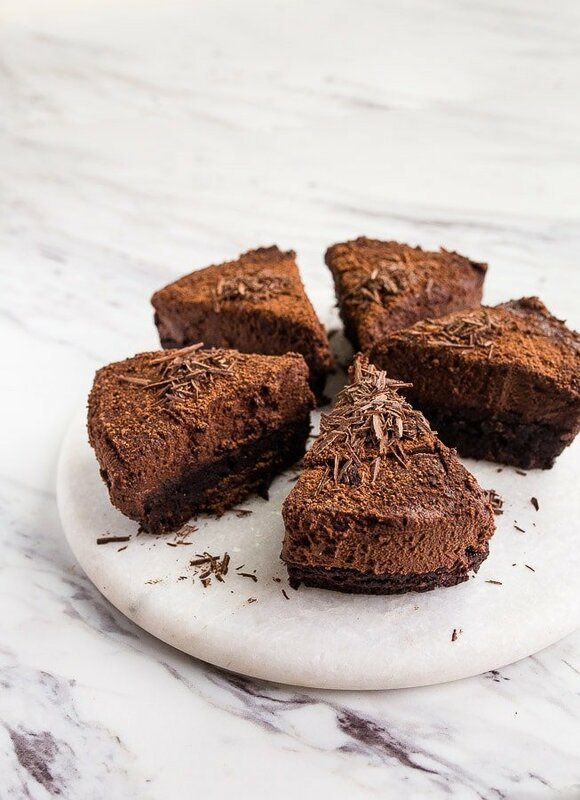 A rich chocolate cake with a brownie bottom and a light and fluffy small-batch mousse topping. This recipe is sponsored by Godiva. 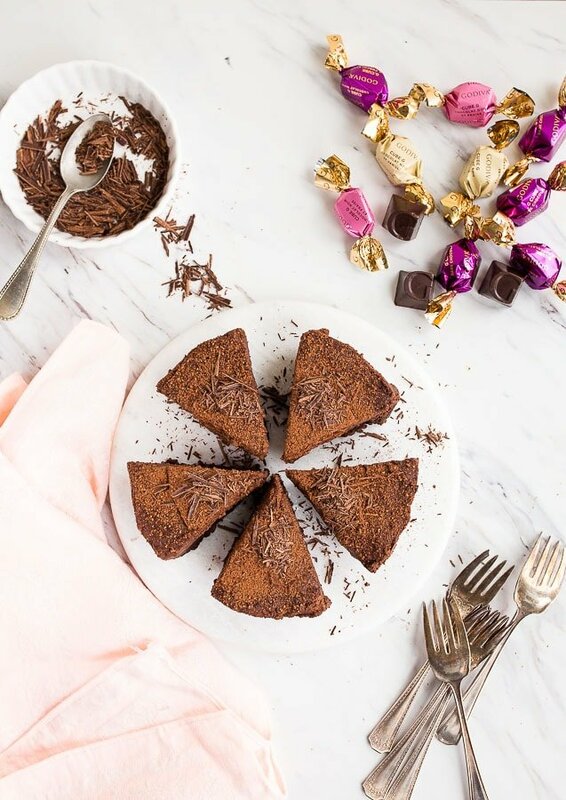 It feels a little like Valentine’s Day today with this chocolate mousse cake for two, but it’s not! It’s just an everyday chocolate cake, made a little fancy with mousse on top. I reworked my brownies for two recipe to bake them in a 6” springform pan with the goal of piling fluffy chocolate mousse on top. I imagined 4 petite slices of chocolate mousse cake, but after one bite I realized how rich it was—this cake is best sliced into 5 or 6 petite slices. 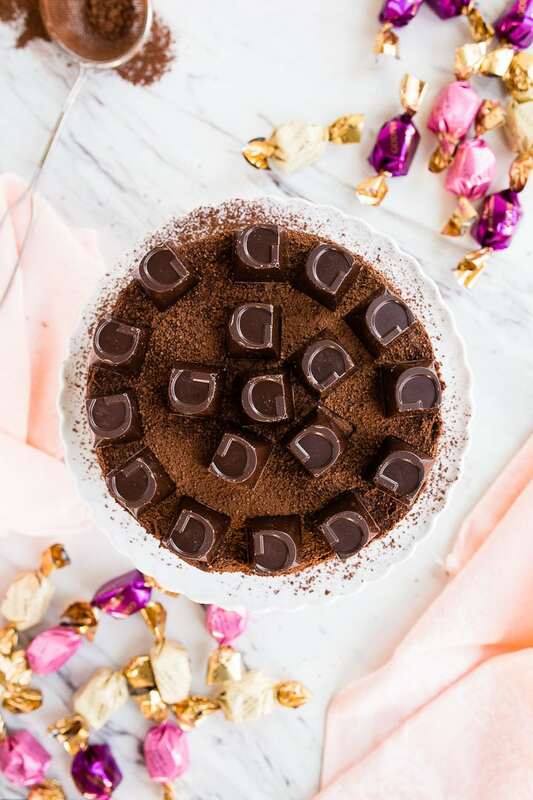 The extra fancy part of this chocolate mousse cake is the Godiva G Cube truffles on top for decoration! If G cubes are new to you, let me catch you up: they’re bite-size individually wrapped truffles from Godiva. They’re filled with a smooth, perfectly flavored chocolate ganache. They come in 10 flavors, which is a fun way to change up this cake. This time, I topped the cake with vanilla and strawberry G cubes, but my husband requested one with mint G cubes next. After baking the brownies in the springform pan, I set them aside to cool. You can do this a day ahead of time, too. My springform pan has 3” sides, but if your pan is a little shorter, it’s fine. My chocolate mousse topping didn’t come all the way to top, so a 2” pan works, too. 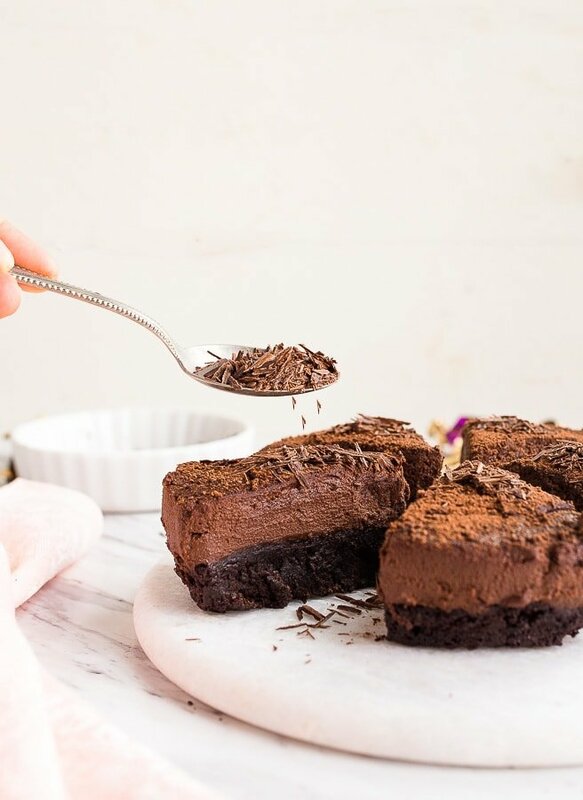 I use a springform pan for this chocolate mousse cake for a few reasons. One, it helps shape the mousse into the perfect pile of frosting on the brownie bottom. After a quick chill, just snap the pan open to remove the cake easily. And two, a springform pan is the easiest way to remove a cake from a pan. But, here’s the deal: this chocolate mousse cake for two is so delicious, that if you only have my regular 6” cake pan, just use that! The cake might not come out perfectly and look like a perfect slice of cake from a Patisserie, but it will still taste just as delicious! Let’s eat delicious desserts, regardless of their imperfect appearance, ok? I should be in a help group for my addiction to beautiful desserts. One tip on removing a cake from a springform pan. Run a knife around the edge of the pan to release the mousse. 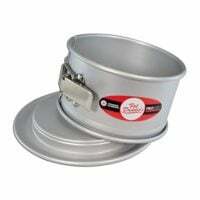 Place one hand on the bottom of the pan to support the cake while using the other hand to pop open the spring. Then, let the pan fall on your arm (like a bracelet); don’t worry about catching the ring part—worry about the cake! If you chill the cake before attempting to remove, it helps so much! This chocolate mousse recipe isn’t overly firm or soft, it’s just right. You can pipe it and it will hold its shape, but it will be slightly firmer in the fridge. Since we live the small batch life (meaning, I create small desserts and small dinner recipes), my chocolate mousse recipe is predictably smaller. When scaling down a recipe and making a small portion, the recipe should be easier, don’t you agree? It doesn’t seem right to go through lots of trouble for a small reward, in my opinion. I’ve always tried to make my recipes easy, quick and less than 10 ingredients. I approached my chocolate mousse recipe this way, too. While it uses 2 separate bowls (one for mixing ingredients and one for whipping cream), it’s so worth it. I started with just 1 egg and built the recipe around it. Plus, if you’re one of those people that worries about consuming raw eggs in typical chocolate mousse, this recipe uses a fully cooked egg! There’s no way I could make a raw egg dessert in my house with a toddler running around—a toddler who loves chocolate, by the way. I don’t recommend chocolate chips for making this mousse because they don’t melt as smoothly as a chocolate bar, but if it’s all you have, it’s fine! You just might have some flecks of chocolate in your final mousse, but it’s still perfectly delicious. If you’re not up for making a mousse cake, just make the mousse frosting here and serve it in two ramekins with a few raspberries on top. Chocolate mousse cake for two. First, preheat the oven to 325 and spray a 6” round springform pan with cooking spray. Dice the butter into equal pieces, and place in a bowl with the sugar and cocoa powder. Microwave on HIGH for 30 seconds. Stop, stir, and microwave for another 30 seconds. Carefully remove the bowl from the microwave, and stir the salt and vanilla in briefly to cool the mixture. Stir the mixture for about a minute to cool off the butter. Then, add the egg and mix well. Sprinkle the flour on top, and then stir vigorously for 50 strokes, using a wooden spoon. This activates the gluten and makes your brownies so chewy! Scrape the mixture into the prepared pan, and bake on a small sheet pan for 24-28 minutes. It’s okay for the brownie to stay a little gooey in the middle. Let the brownie cool completely; you can make this a day ahead of time. Next, make the mousse: beat the egg with the sugar for about 2-3 minutes, until it’s pale yellow and foamy. Beat in 1/2 cup of the heavy cream just for a few seconds to combine. Pour everything into a heavy-bottomed saucepan, and place over medium heat. Stir constantly while the mixture starts to thicken, about 3-4 minutes. Do not let it boil or simmer. It will start to coat the back of a spoon when its thickened. Remove from heat. Add the chopped chocolate to the pan, and cover. Let sit undisturbed for 1 minute. Remove the lid, and whisk very well to dissolve the chocolate. Pour this mixture into a bowl and chill it for about an hour. It will start to firm up. About an hour before you want to serve, beat the remaining 1/2 cup of cream in a clean bowl until soft peaks are just starting to form. Remove the chocolate mixture from the fridge, and break it up into bite-sized pieces. Begin adding these chocolate mixture pieces to the bowl while beating the cream. After a few minutes, everything should be homogenous and fluffy. Add the vanilla extract to the mixture, and beat just to combine. Scrape the mousse on top of the brownie in the springform pan and refrigerate for an hour before serving. When ready to serve, pop open the springform pan, place one hand under the pan and let the rim of the pan fall around your arm. 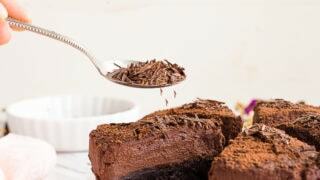 Slice the cake into 4 to 6 even slices, top with shaved chocolate or Godiva G cubes and serve. I am mesmerized by those chocolate shavingss and I will take anything topped with Godiva chocolate. I bet any of them would work with this. Those vanilla/strawberry ones sound divine. Especially with the chocolate. I wouldn’t blame Camille for wanting to grab a spoonful of this. Cannot wait to make this cake. Look delicious. Hmm. I have regular six inch pans and a seven inch springform. Which should I use? Or buy yet another baking pan, lol. This looks absolutely heavenly! And I love those G truffle on top. Perfect to share with just the hubs and I! Missing a step in the mousse where you add the vanilla. Assuming that’s at the same time as you’re whipping the cream? I’m referring to the mousse part, not the brownie. It references vanilla in the mousse section but nowhere in the instructions on when to add that. Oh thank you so much, Laurie! Thanks for sticking with me! I’ll get that corrected for you right now :) Thanks again! No problem! It turned out great – so rich, but so good! I ended up doubling it and put it in a normal size springform and it was a good amount to fill that. Wanted to leave that note for anyone else wondering about a larger batch (which I know defeats the purpose of dessert for two, ha!). Would this cake do okay if I completed it, including the mousse, the day before serving? I would be keeping it in the fridge until serving. Hi Christina, I’m in the process of making this recipe. So far, so good…I just put the finished mousse on the brownie bottom and am refrigerating it for Valentine’s Day dinner tonight. Regarding the measurements, as I went to make the brownie, I saw that the recipe called for 42g of Cocoa Powder. That seemed like more than 1/4 cup + 2 Tbsp, so I double checked with King Arthur Flour ingredient weight chart ( https://www.kingarthurflour.com/learn/ingredient-weight-chart.html?filter=Cocoa ), and I found that according to them, 1/4 cup + 2 Tbsp = 31g. Could your measurement be a typo? Another question I have is in regards to the mousse. I made your 5-Minute Mousse recipe last week, but it turned out more crumbly than creamy, like very thick frosting. I ended up breaking it up into a brownie batter. In contrast, the ingredients and instructions for this recipe were spot-on…it’s a lovely soft and silky mousse with an intense chocolate flavor. Comparing the two recipes, what do you think happened? Could it be the increased chocolate and the reduced cream in the 5-minute version? I frequently use your Dessert-for-2 recipes and love the new look to the site. Keep up the good work! Hmm…when it comes to cocoa powder, I think the problem is that I usually ‘heap’ cocoa powder instead of level the measuring spoon because cocoa powder is very forgiving in recipes. It acts like flour, but not as strong. The measurement of 42 grams is exactly what I added to the recipe. King Arther Flour must be leveling the cocoa powder with a knife, which is a little silly and hard to do, in my opinion. As for the mousse recipe, this has happened to me once when my chocolate seized when it hit the cold cream. I’m sorry, that’s a bummer! The mousse recipe for this recipe (mousse cake) is much more forgiving (though a bit more time-consuming), so you can absolutely use it for the brownies. Hope this helps! Best of luck :) Thanks for writing!